Greyhounds used in the racing industry are treated like unfeeling machines and run until their bodies are broken and destroyed. But for many of those dogs, “retirement” means even more suffering. 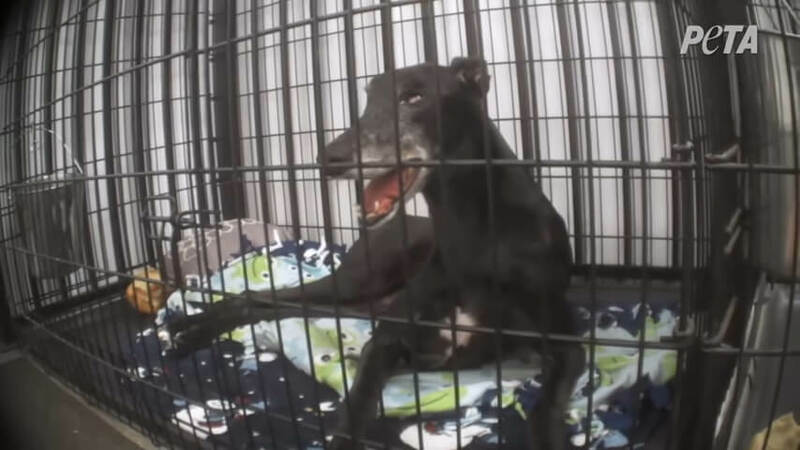 A PETA eyewitness investigation revealed that the canine blood bank Hemopet—which claims to be a “rescue” facility for discarded greyhounds—keeps around 200 dogs in tiny crates and barren, rusty kennels for about 23 hours out of every day. 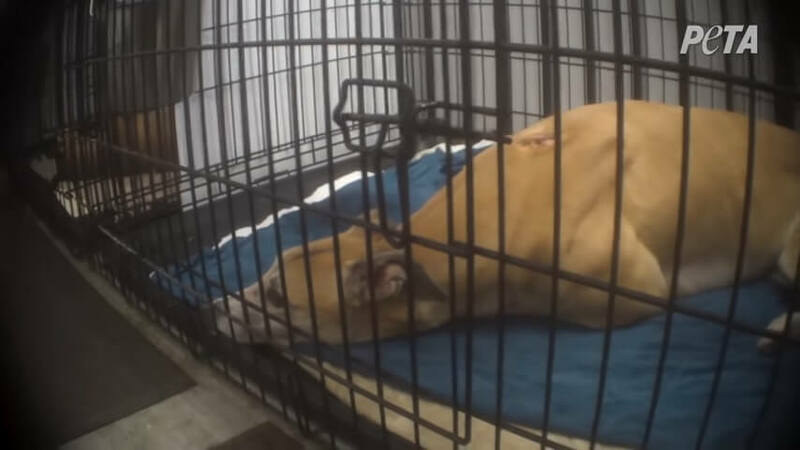 These greyhounds—who, like all dogs, are eager to run and play and long for companionship—are reduced to being bled for cash. Sick, suffering, and stressed, these dogs have been forgotten by the world, but PETA wants you to know some of their stories. 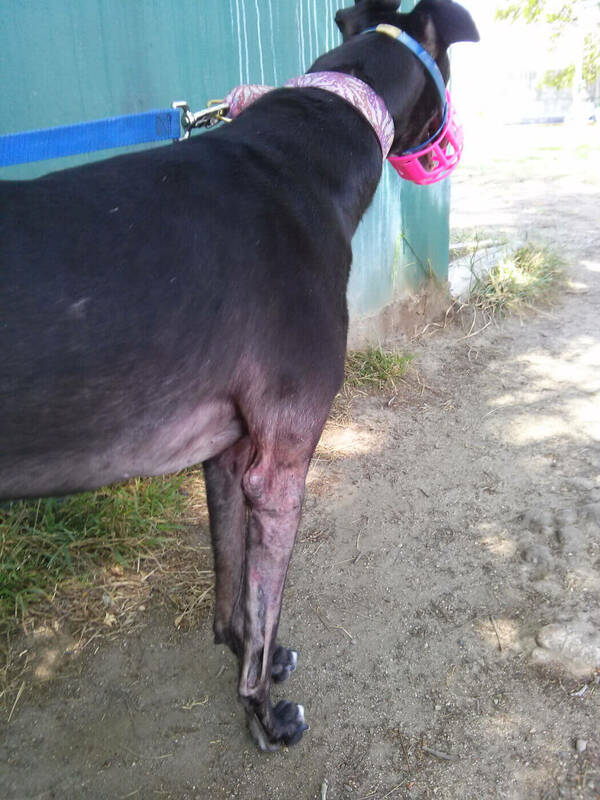 Under the racing name Gloryusfinish, Glory was raced over 160 times before she was discarded at Hemopet, where she was bitten on the back by her stressed kennelmate. 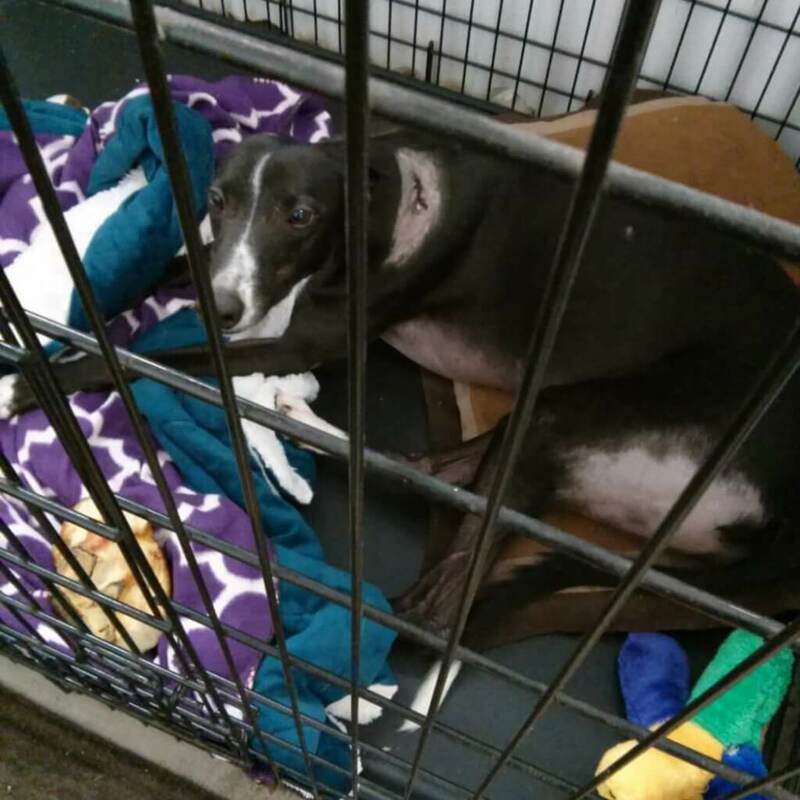 After her wound healed, the kennel supervisor put her back in the pen with the same dog who’d bitten her—despite a warning by another staff member that the two were not a good match—with instructions to keep them muzzled and deny them toys. Gibbs reportedly suffered from a neurological disorder that often involves tumors in the chest. He quickly became lethargic and barely responded to his own name. A much-needed veterinary appointment was never made for him, according to Hemopet staff. 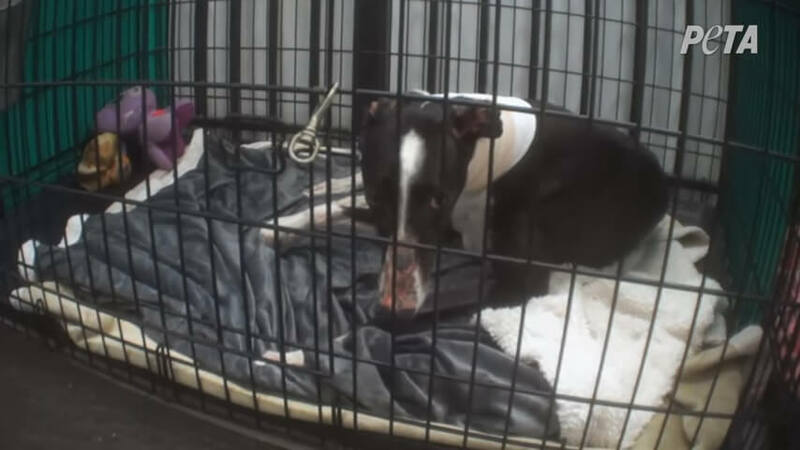 He was left crated for weeks until a worker found blood in his water bowl. He was finally euthanized after an X-ray revealed that he had a large mass on or near his lungs. Pidgeon was apparently attacked by her kennelmate, resulting in gashes on her neck that required stitches. Melyn required sutures on her chin after her kennelmate bit her, but staff reportedly went home for the night, leaving the open wound untreated until the next day. Bunny suffered from a cough that had apparently persisted for over a year. Her blood was still taken to be sold, despite her ailing condition. WendyLu had red, peeling skin on her nose. Hemopet staff speculated that she had lupus but said that no tests had ever been run to diagnose her. Dogs with this disease can have a low platelet count, but her blood was taken, anyway—even though it may not have contained all the components that dogs who are given blood transfusions urgently need. Like many of the other dogs at Hemopet, Genie was missing hair. She also had red, irritated skin on her leg. A veterinarian said, “In my professional assessment, the high number of dogs with areas of hair loss and callused skin is indicative that the dogs are chronically suffering from long-term excessive confinement, with limited opportunity for mobility and activity necessary for optimal health and welfare” [emphasis added]. Dogs like these deserve homes, not cages. Here’s what you can do. Don’t allow greyhounds to continue to suffer where no one can see them. Share these stories with your friends and family. 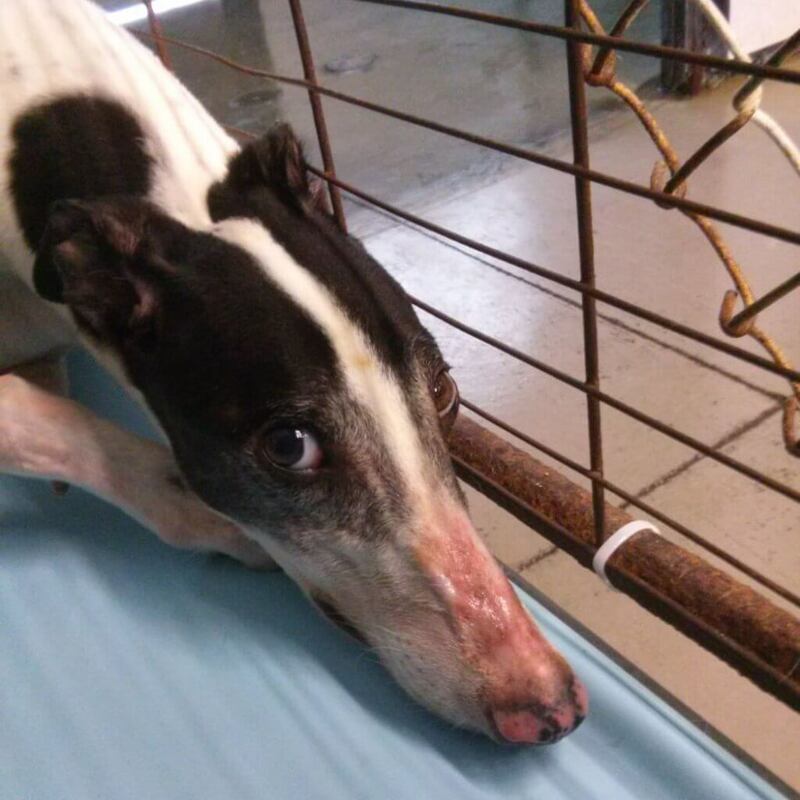 Demand that the National Greyhound Association (NGA) bar its members’ dogs from being held captive in blood banks—including those operated by purported rescue organizations—effective immediately.